While this past weekend touted "the most exciting 2 minutes in sports" and "the biggest fight of the century", the Kentucky Derby and the Pacquiao/Mayweather fight couldn't hold a candle to the event fashion lovers were waiting for. Last night was The Costume Institute's Metropolitan Museum of Art Ball, or: the biggest night in fashion. The theme was "China: Through The Looking Glass", based on the opening of the new exhibit with the same name. Celebrities had a chance to turn out in the top designers' haute couture visions in homage to China. Some did it in subtle fashion and some really pushed the envelope. Here are some of my favorites from the event. Cara Delevigne wore slim cigarette pants by Stella McCartney- but her true statement was in the dozens of cherry blossom tattoos she donned- fake, of course. Model Caroline Trentini's high-necked Atelier Versace dress was structured yet draped in such a way to provide just enough romantic movement. Diane Kruger chose sparkly Chanel pants and an embellished bodice top in the lightest shade of pink - a perfect combination of modern and feminine. Television personality Jackie Miranne looked absolutely stunning in a navy gown by Christian Siriano. The turquoise tassel earrings were an unexpected yet fitting complement. Kate Beckinsale's DVF frock was not the most dramatic or costume-y of last night's looks, however it wins for sheer glamour and perfect execution- from the gold fabric to the draped bodice, it was simply beautiful. Kendall Jenner looked stunning in a shimmering green ombre Calvin Klein dress with a daring tie-up detail on the sides. Altuzarra fashioned a very Black Swan-esque dress for Keri Russell- with onyx and dark green feathers and a high slit, she upped the glam-goth factor with a smoky eye. Sienna Miller's Thakoon pantsuit sparkled in the color of the night - red- and was another non-gown look that worked for it's unique embellishments and chic styling. 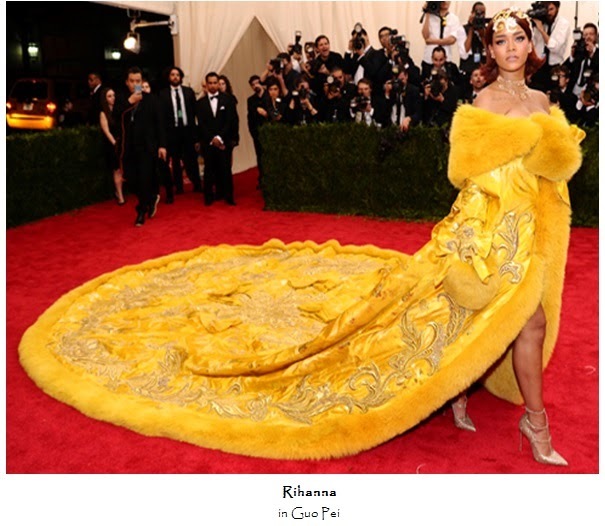 Chinese couturier Guo Pei created Rihanna's jaw-dropping cape. With yards of intricate embroidery and bright yellow color, it's easy to crown Rihanna's look as Met Gala red-carpet royalty. What did you think of this year's Met Gala fashion? Which was your favorite look? Whether you prefer understated elegance or full-on statement-making drama, there were gorgeous fashion pieces all fit for an art exhibit of their own.